The Inn’s owner, Jefferson Vander Wolk, built the hotel in 1965 with the intention of providing a home for travelers visiting Santa Fe whether it be for business, politics, or to enjoy the inspiring culture, architecture, and geography. In the process, he established a management philosophy based on not only welcoming guests into our “home,” but the employees as well. Throughout the years, Mr. Vander Wolk has been exposed to Quality Management and the theories of Dr. Edward Deming, which drove Mr. Vander Wolk to augment the Inn’s foundation of “home” with a never-ending pursuit of quality. Dr. Deming is known as the father of quality, and is generally considered responsible for Japan’s rejuvenation following World War Two. Through his systems based model and adherence to quality above quantity, the Japanese have become one of the world’s strongest economies. In 1995, Inn of the Governors embarked on their own quality journey, adopting Dr. Deming’s philosophy of quality systems. Through this process, Mr. Vander Wolk also incorporated principles developed by Lincoln Electric and Newcorp Steel, whereby the employees themselves share in the profits of the company in a direct, cash based manner. Additionally, Mr. Vander Wolk created a code of values that promotes employee growth through integrity, customer focus, joy, and respect. Through these values, the Inn strives to create a work environment that honors the employee and thereby promotes personal responsibility. These in turn provide a more delightful guest experience. In the spirit of Deming’s continual improvement, the Inn adopted a team based management approach in 2010 whereby each department convenes monthly to review guest satisfaction, financial performance, and safety. It is in these meetings that employees work together to find ways to surpass guest expectations while making the hotel run as safely and efficiently as possible. 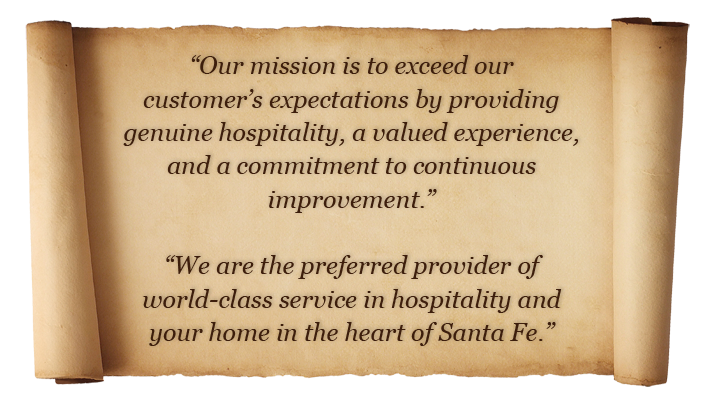 This style of management is precisely what allows our team to bring you the best Santa Fe hotel experience you can find. No other hotels in Santa Fe will bring you the dedication, joy, and personal pride that Inn of the Governors has to offer. The Inn of the Governors believes in a straight forward, simple approach to hotel rates: a good room with good amenities at a good price. Naturally our rates fluctuate based on the economy, the date of booking, and changes in the local market, but we always provide our world-class service, complimentary Mountain Sunrise Breakfast, free parking, and afternoon Tea & Sherry to help you further enjoy our Inn and Santa Fe.